SIMI VALLEY, Calif., July 9, 2018 – Rapattoni Corporation (Rapattoni) announced today that real estate industry veteran Scott Quinn has joined the company as Vice President of Sales. 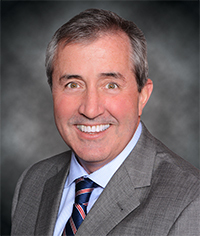 Mr. Quinn brings over 30 years of industry experience to Rapattoni and will focus on Rapattoni MLS sales as well as lending his expertise to the company’s other products and services, working closely with Vice President of Sales Kevin Wolfe and the company’s sales team. Mr. Quinn joins Rapattoni as the company continues its drive into the future with a series of updated products and services. The company’s new direction began in 2015 with an increased focus on innovation and user experience, highlighted by the successful launch of the new Rapattoni Magic-Cloud AMS product, continued expansion for Rapattoni’s Integrated Website Service (IWS), and exciting new enhancements for the flagship Rapattoni MLS software. Rapattoni is also offering a “front end of choice” solution allowing Rapattoni MLS to run parallel with MLS software from other vendors, a system which is currently in place for the Miami Association of REALTORS®, located in South Florida, as well as the Lexington-Bluegrass Association of REALTORS® in Kentucky. In 1986, Mr. Quinn entered the real estate industry with Offutt Publishing Company in Greensboro, North Carolina, an MLS book publishing firm which would go on to release InnoVia as one of the country’s first Web-based MLS systems. Mr. Quinn rose to President in 1995 and, when the company was sold to First American Financial Corporation in 2007, Mr. Quinn ran InnoVia as a separate division under their Real Estate Divisions Group as Senior Vice President until First American spun the group off to what is now called CoreLogic. With CoreLogic, Mr. Quinn served as IT Manager II, Senior Product Manager, and Principal Account Executive before moving to MMSI in January of this year. Mr. Quinn will serve on the Rapattoni leadership team, working with Chief Executive Officer Niki Rapattoni, President Ralph Hoover, Executive Vice President Brian Tepfer, and several other industry veterans to set the company’s direction into the future. The 12-person leadership team brings together over 290 years of experience and leadership in the real estate industry. Rapattoni MLS provides advanced features such as integrated GIS parcel mapping, an integrated member management and billing system, the industry's most advanced RETS 1.7.2 data exchange system with RESO Web API support and RESO Data Dictionary v1.6 Platinum certification, integrated aerial photography, and a robust statistics and trends analysis package. Rapattoni MLS is compatible with the Internet Explorer, Microsoft Edge, Firefox, Safari, and Chrome web browsers, can be run on PCs and Mac computers, and works seamlessly on popular smartphones and tablets with a native app available for iOS and Android devices. Rapattoni association management software (AMS) combines Rapattoni's extensive real estate industry knowledge with the latest technologies to give associations the most powerful, flexible, and intuitive productivity suite available for managing association needs. Rapattoni’s Hosted Magic AMS service helps associations eliminate expensive server hardware and software licensing by moving to cloud storage. The optional Internet Member Services (IMS) module allows association members to pay their dues, register for classes, and interact with the association online. Rapattoni Magic-Cloud AMS, the new version of the company’s industry-leading AMS system, offers a variety of innovative features and a redesigned interface. Rapattoni's Integrated Website Service allows associations and MLSs to easily create sophisticated interactive websites with configurable content, features, and modules. Highlights include a variety of template styles, a powerful content management system, and a member’s dashboard, plus expert installation and support. Rapattoni IWS meets the NAR Core Standards for interactive websites and it integrates with Rapattoni’s Association Management Software, Internet Member Services, and the Rapattoni MLS.